Doesn’t everyone long to hear these words? To be told they are loved unconditionally? 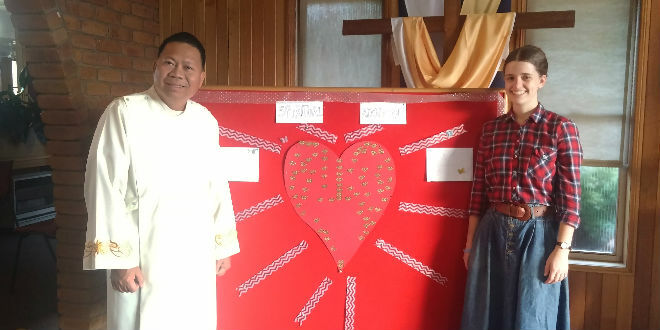 My own experience of love and the desire for everyone to experience this love is what inspired me to spread the culture of life with the 2016 spiritual adoption program in Sacred Heart parish, Toowoomba. Spiritual adoption involves praying for an individual unborn baby for nine months, begging the Lord to spare them from abortion. Despite the temptation to make abortion the single issue, spiritual adoption involves praying not only for an end to abortion but also for a renewal of the culture of life. Each parishioner prays for a renewal of the culture of life in the family of their spiritually adopted child. We pray that the parents and doctors will see the beauty and sacredness of the life God has entrusted to them, and thus the child will be spared from abortion. Sacred Heart parish has run the spiritual adoption program for about five years now and I was delighted to see that 75 babies were adopted this year at the launch on April 10. In March this year I was privileged to visit the Sisters of Life in New York. During my time there I discovered that an essential element of the culture of life is joy. 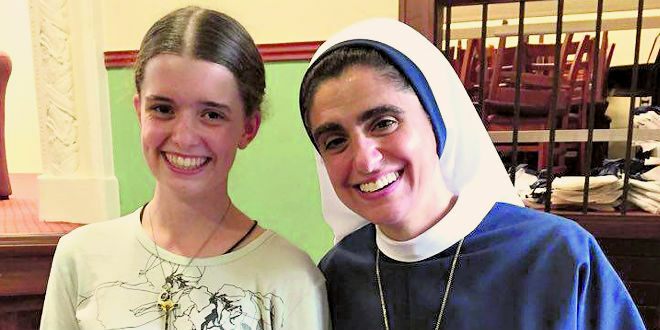 Joyful: Sr Mariam and Nancy Webb during her recent visit to the Sisters of Life in New York. The Sisters of Life were founded in 1991 for the protection and enhancement of the sacredness of every human life, and they said joy is central to their mission. Their founder, the late Cardinal John O’Connor, asked that the quote “There can be no Sisters of Life without Joy” be in each sister’s room. Joy is so important because it is at the very heart of Jesus himself. The Lord delights in us, and we need to receive His joy and allow it to overflow to those we meet. While on retreat with the Sisters of Life the Lord revealed His infinite love for me. I can testify that when I know I am loved I am the happiest person on earth. Having been inspired by the Sisters of Life I hope to share some of the love and joy of the culture of life here in Australia. The spiritual adoption program is definitely one way to do this.